A relatively unknown composer with some of the most luscious classical works ever created, Gabriel Fauré is our Composer of the Week! 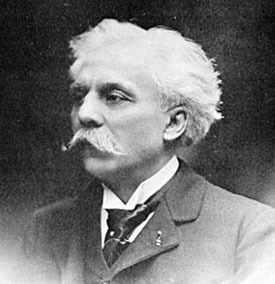 Gabriel Fauré grew up playing the harmonium in a local chapel and went on to work as a church organist for many congregations in France. Fauré was a prolific composer and was especially known for his Requiem, Masques et Bergamesques, piano quartets, other chamber works, songs, and extensive works for piano. Despite this, Fauré was quite insecure in his musical abilities and focused on writing songs, piano works and incidental music until he reached his sixties. In 1905, Fauré took on the prestigious position of director of the Paris Conservatory. His presence was a pivotal time in the institutions history, and Fauré was later awarded the highest class in the French Legion of Honor.